Great news for gamblers who like to take their gaming on the go: South Africa’s favorite online casino, Springbok Casino, has announced that its mobile platform has rolled out a new app for Android smartphones and tablets. This new (and free!) 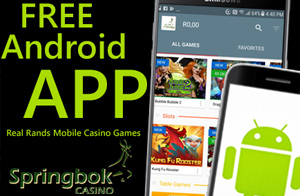 app is now the easiest and most convenient way for Springbok Casino Android users to access the casino and play their games. Springbok Casino wanted to make it as simple as possible for players to be able to access the new app and has promised that installing it will be a breeze – even for the most technologically-challenged! The next step is to press the Download Now icon. The Android app will be automatically installed in just a few short moments. Players can then log on and begin their Springbok Casino mobile gaming adventure. The manager of Springbok Casino, Daniel van Wyk spoke about the new app and the reason behind its creation. Of course, it’s also possible to play mobile casino games at Springbok Casino without installing the app. Players simply need to head to the online casino and play within their browser (preferably Safari or Chrome). However, the convenience of using a mobile app cannot be ignored. Once players are able to access the new casino through their mobile device, they will be taken to a lobby that has been especially created for smaller handheld screens, as well as tablets. The games for the Springbok Casino Android app have also been designed to make them easy to play and they take full advantage of every space available on the screen. A host of mobile-compatible games such slots and table games are available on this mobile platform. Game play can be paid for in South African Rands, and fantastic promotions are available to download and mobile players alike.